Everyone’s heard of Igloo coolers. Heck, just about everyone has probably owned an Igloo cooler (and most likely an Igloo Playmate Cooler). There’s a decent chance one’s sitting around collecting dust out in your garage right now. The company’s maintained a dominant presence in the market for decades now. But how have they managed to do it? Do they make the world’s best coolers? Are they marketing geniuses? Are they just flat-out lucky? Maybe it’s a bit of a combination of all these things, but really it boils down to one word: value. There are better-performing coolers out there, sure. And there are certainly cheaper coolers out there. But in our opinion, no one has mastered the combination of quality, price, performance, and durability quite like Igloo has. In this article, we’re going to review Igloo’s entire line of Playmate coolers (16-quart, 7-quart, 4-quart, and soft Gripper). The Igloo Playmate is so much iconic cooler that’s been tried, tested, and loved for decades now for everything from picnics, to camping trips, to backyard barbecues, to your kid’s weekend baseball games. 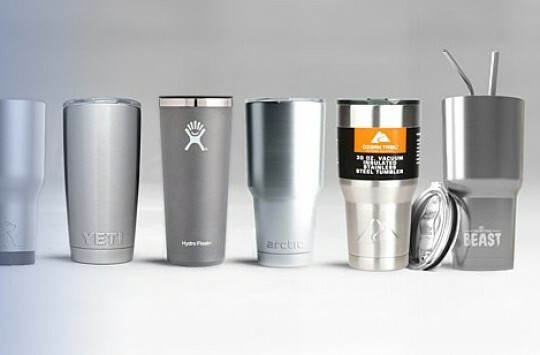 From its classic push-button swivel lid, to its molded one-piece handle and iconic tent-top design, it’s truly the personal cooler that the world’s come to love. 2008 Disney Pixar movie Wall-E. Photo from disney.wikia.com. Far from a single-duty cooler, the Igloo Playmate Cooler comes in a range of different models, sizes, designs and colors; read on to decide for yourself which is your favorite, and which one you want to tag along with you on all your memory-making outdoor experiences. Tip: As the Igloo Playmate Cooler is a great example of personal cooler, you may be interested in our Best Personal Lunch Cooler Guide. This is the classic – the one we all know and love. The 30-can model is a 16-quart cooler, and is one of the largest in Igloo’s Playmate line. For over three decades now, the Playmate Elite has far and away been the best-selling, most popular personal cooler in the industry. 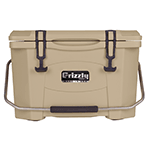 It features the trademarked tent-top, push button swivel lid design and molded-in carrying handle, with a durable frame/body constructed of heavy duty polyethylene. We will say that the title can be a bit deceiving; you can stuff in 30 cans just fine, but that’s without ice. With ice, expect it to hold no more than 16-18 cans. 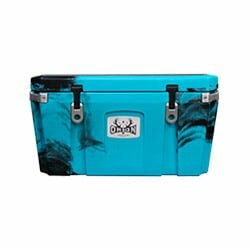 Nowadays with all the buzz and rage being how long a cooler can hold ice for, don’t expect this one to be your go-to choice if you’re wanting your ice to hold for days on end. Expect it to hold for a day’s/afternoon’s use – nothing more, nothing less. More customer reviews and current price to check on Amazon right here. The Playmate Elite MaxCold model features all the same dimensions/features of the original Playmate Elite, but with a beefed-up insulation that offers the best ice retention in the Playmate line. The improved insulation comes in the form of Igloo’s proprietary ‘ultratherm’, which is incorporated into the lid and body. (The traditional Playmate’s are only insulated in the body). Surprisingly, the additional insulation allows for a fairly noticeable difference in performance – while a normal Playmate Elite will hold ice for less than 24-hours, the MaxCold will easily hold out for over a day under normal conditions. With just a nominal price difference between this one and the traditional design, we highly recommend considering a MaxCold for your next Playmate investment. The Igloo Boss adds a touch of masculine style to the traditional Playmate ice chest cooler, with a super cool faux diamond-plate exterior. The diamond-plate is incorporated right into the body, and is constructed of a tough, heavy-duty/impact-resistant plastic. The sure-grip molded handle is also a bit different than the original with its squared-off top, but it’s really the same design as the traditional; an integrated one-piece handle that’s built into the push-button swivel lid. The Boss is a little more beefed-up in size than the normal 16-quart Playmate, with – as Igloo themselves say – plenty of room for ‘hearty lunches and after-work beers’. The exterior dimensions are 14.5” x 10.5” x 13.6”. 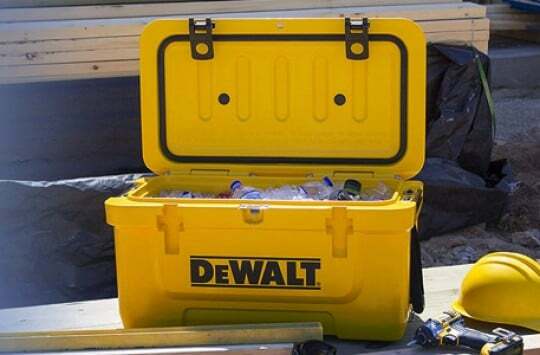 If your buddies at the job site have been giving you guff over your less-than masculine cooler/lunch box, go a step above and beyond and silence them all with the stylish Igloo Playmate Boss. The 4-quart, 6-can mini Playmate is the runt of Igloo’s Playmate litter. If you’ve been wanting a downsized Playmate with all the same designs and features as the original, just in a smaller package, this is definitely the one. The perfect Playmate lunch box, it’s an ideal size for packing your daily lunch meals for school or work, with dimensions of 9.84” x 9.84” x 6.69”. It features all the same iconic designs as the original Playmate Elite, with the tent-top, push-button lid and single-piece molded handle. 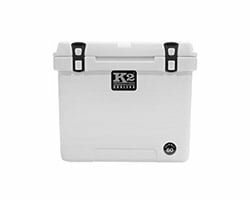 Of course, it’s no coincidence that the Playmate Mini cooler has a 6-can capacity; toss in a sixer of your favorite beer and head out to the lake or river. After you (and a buddy) polish the case off, you’ll have plenty of room to take home your day’s catch. At 7-quarts, the Igloo Playmate Pal is the perfect midsize personal cooler; intermediate between the traditional 16-quart Playmate and the 4-quart Playmate Mini. Actually in recent years, the Playmate Pal 7-quart has become the most popular, #1 selling cooler in its category – more so than the larger 14-quart. 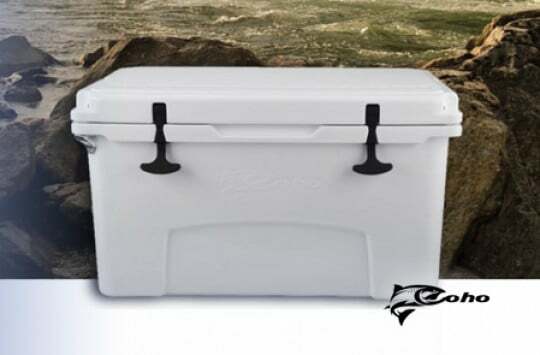 If the 14-quart is the perfect size weekend family picnic/camping cooler, than the 7-quart is the perfect size personal cooler – small enough to pack in your daily lunch to take to school or work, yet roomy enough to load up for a romantic couple’s picnic or short solo fishing trip. Capacity-wise, expect the Pal to hold nine 12-oz cans with ice. Although the 7-quart is the perfect intermediate size, with a sub-$30 price tag why not go ahead and load up with the full Playmate line? The 14-quart traditional, 7-quart Pal, and 4-quart mini to keep all the family together. The Gripper 16 is the soft version of the traditional Playmate Elite. If you’ve loved your Play mate cooler dearly over the years but only wished that there was a way to sling it over your shoulder, now there is. Although the iconic tent-top design is maintained, the Gripper soft bag features a zipped lid, separated dual-compartment internal storage, and front and back slip pockets. Additionally, the MaxCold model features 25% more insulation than the original Playmate, keeping your drinks and snacks cooler for longer. The main inside compartment is constructed of a leak-resistant, antimicrobial PVE liner; functional and easy to clean. 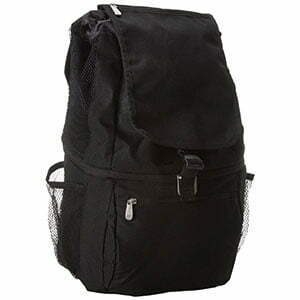 An absolutely perfect Playmate lunch box or light picnicking cooler bag. Check the current price and read customer reviews on Amazon. The bottom line is, we’re massive fans of the Igloo Playmate cooler line. There’s a reason that these classic little coolers have remained so popular over the years, and like we said it comes down to that one word: value. With sub-$30 price tags on most models, they truly are – in our opinion – hands-down the world’s best value personal coolers. Additionally, we think it’s fantastic that Igloo has expanded the line of Playmate styles and designs; with four different sizes and options available (16-quart, 7-quart, 4-quart, and soft Gripper), we don’t even think it’s a matter of making a choice between them – just go ahead and bring home the entire Igloo Playmate family! Click to see all Igloo Playmate Coolers available on Amazon. Tip: You can also check our in-depth Igloo Coolers guide and our earlier post on small coolers.